Swetha: My name is Swetha. 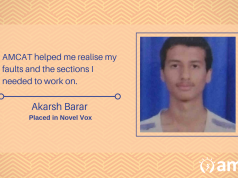 I am pursing B.Tech in Computer science and want to excel in my technical skills to be able to contribute to the success of the organization. Swetha: I did not face any difficulty as I got selected in Mindtree through AMCAT without interviewing for too many jobs. Swetha: The AMCAT test was very useful. 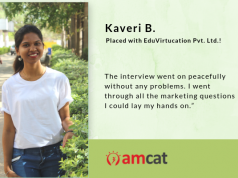 Without AMCAT, I would have not been able to access and get the opportunity to work with Mindtree. 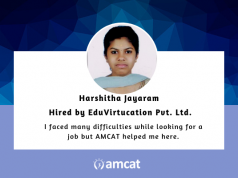 Swetha: Yes, I have already advised many of my friends to take the AMCAT test because it is a great platform which gives you access to many good career opportunities. Swetha: Take AMCAT and start preparing for your technical skills. Only aptitude and logical skills will not be sufficient for getting a job in today’s job scenario.